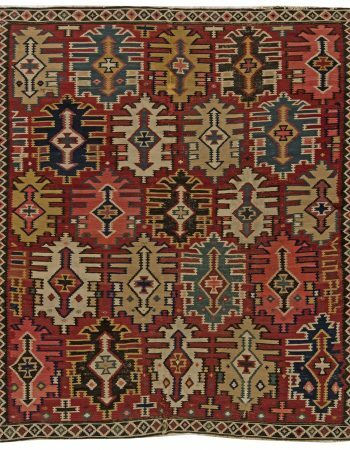 Vintage Moroccan – Kilim Rug, a Mid-20th century vintage Moroccan antique rug, Circa: 1950, Origin: Morocco. 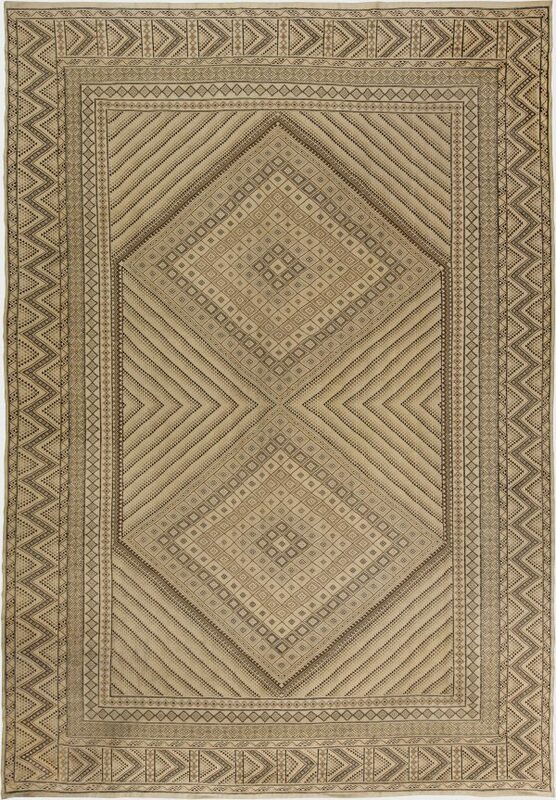 This Moroccan flat-weave area rug will constitute an extremely tasteful complementation to absolutely any interior – classic or modern. 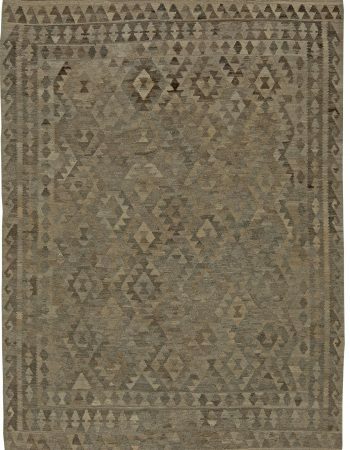 It captures the traditional Kilim motif’s symbolism in a contemporary form. The central plain is dominated by two grand rhombuses, consisting of numerous smaller ones, enclosed in a hexagonal shape. 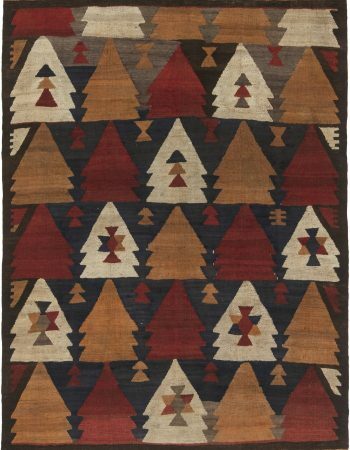 A quadrilateral, usually filled with some inside figures, is known in Kilim tradition as ‘Göz’- the Eye. It is supposed to ward off the Evil Eye, precisely to protect the owner from any malevolent glares. 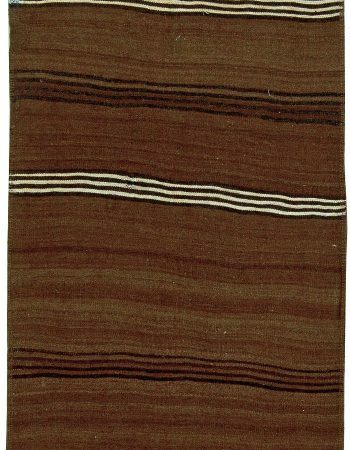 Zigzags, closing the longer borders of the carpet, are a symbolic representation of running water, which was an exceptionally scarce resource in tribal life. Geometric, symmetrical pattern is accompanied by sublime shades of sand and sepia colors. 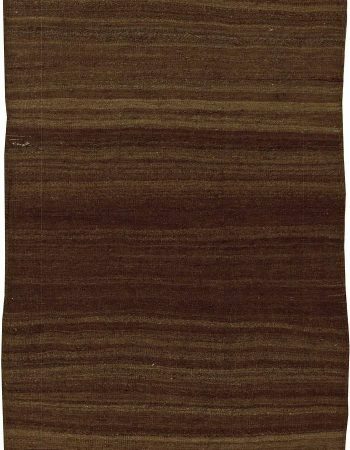 The vintage area rugs and moroccan carpets emanates good energy, and who knows, its symbols may well prove to be working.